A freeware application for the iPod Touch can turn the music player into a virtual mobile phone. 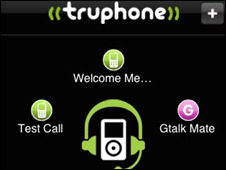 Truphone uses wi-fi technology in an iPod Touch to allow users to make calls to other iPod Touch owners and Google Talk's messaging service users. The software is a spin-off from technology Truphone developed for smartphones and iPhones. The developers plan to have the ability to make calls to and from landlines in place very soon. Ipod Touch owners keen to use the software will also have to buy a clip-on microphone for the portable music player. Truphone is the latest firm to offer voice over internet protocol (VoIP), alongside Unlicensed Mobile Access and proprietary protocols such as Skype. Geraldine Wilson - Truphone's CEO - said the firm had ambitions to become a global internet player. "There are a slew of new features we're rolling out for the iPod Touch that will let users call landlines, Skype users or send instant messages. We're talking weeks, not months, before these go live." Although Truphone technology can, in theory, work on any mobile device, the firm is concentrating on devices that have an application store. "We've decided to focus on devices that are wi-fi enabled and have an apps-store. For the consumer, there has to be an easy way of downloading an application." "Our focus on the consumer side - at least in the short term - is finding devices that fit that category," said Ms Wilson. The only catch is that for a wi-fi connection to work, users need to be within range of a wi-fi network. Truphone founder - James Tagg - said that the technology also worked on other mobile devices, albeit in a slightly different way. "If you were using Truphone on a Blackberry, it will use cellular technology to log into the Truphone's website." "From here you can make an international call, call a user on VoIP, or send an instant message." "Because the first leg of the call - from the user to our server - is charged at local rate, you're talking a bill of pennies, rather than pounds, to call, say the United States." The company said Google's Android operating system would be the next platform for which it will develop the Truphone applications.